Recently there’s been much in the news about the quagga mussel, a native of the Ukraine that, with its cousin the zebra mussel, has wreaked havoc in the Great Lakes and has now been found in Lake Havasu. Experts fear the mussels could find their way into the Sacramento-San Joaquin Delta– part of what is already the most invaded estuary on earth. Invasive species arrive in the Delta and Bay through a variety of means: riding in ocean liner ballast water, hitchhiking on hulls of recreational boats, dumped from home aquariums. The sudden addition of a new variable can throw the whole ecological equation out of whack. For example, the Asian clam, first spotted in the Bay in 1980s, has proved such an efficient filter feeder than it has contributed to crashing levels of plankton, the microscopic plants and animals that form the base of the food web. This in turn has had serious consequences for the native fish that feed on the plankton. The best defense is preventing new invasives from becoming established. 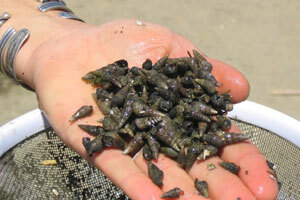 This past summer, The Bay Institute worked with scientists from UC Davis and the Smithsonian Environmental Research Center on a project to eradicate an invasive Japanese mud snail, Batillaria attramentaria, from Loch Lomond Marina in San Rafael (a project we hope to continue this year). Project lead Heidi Weiskel, a UC Davis graduate student, tells me it is the first attempt on record to eradicate a soft sediment invertebrate. The snail is a threat because it competes with the native California horn snail and because it carries a parasite that can infect native fish. If its population were to grow too large, the snail could disrupt the mudflat ecosystem by creating a hard pavement of dead shells that can prevent shorebirds and others from foraging. So far, the snail’s appearance in the Bay has been limited to Loch Lomond Marina, giving hope that it may be eradicated before it spreads to the rest of the Bay. The eradication process was low-tech and Bay-friendly, with no chemicals involved (apart from the coffee fueling the volunteers). Community members– including families, students, Cub Scouts, and others– simply donned boots or old sneakers, went out, and methodically plucked the snails from the mudflats. I found eradicating invasive mud snails a surprisingly meditative way to spend a Saturday. The snails’ conical shells are only about an inch and well camouflaged in their muddy and pebbly surroundings. At first you can’t imagine how you are going to find them. And yet, after a little time spent staring intently at the mud, that distinctive shell shape comes somehow into focus. Foreground distinguishes itself from background, and all at once you see the little guys everywhere. Then begins the process of removing them, snail by snail. Controlling invasive species may seem like holding back the tide. Still, in the course of just five eradication days spread over three months, volunteers removed 69,000 snails, estimated to be half the population in the project area. 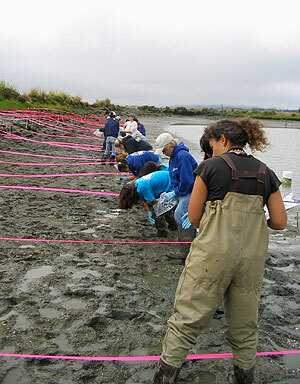 Further, by following protocols established by the researchers, volunteers were contributing to our scientific understanding of effective eradications, even as they were helping the Bay. All that, and the calmness of mind that comes of a morning spent meditating over mud. Eradicating snails sounds meditative much like other foraging activities such as hunting mushrooms, picking berries, or fishing. Too bad the mud snails don’t sound quite as appetizing. Kyle, I like what you say about the mental state of foraging, and it does seem very much the same as what we experienced searching for mud snails. Pollan suggests this perceptual ability makes good evolutionary sense in an environment where most food (apart from fruit) “hides” from us. And no, even apart from their being so tiny, I don’t think one would want to eat the mud snails . . .even with garlic butter. Before moving to California almost five years ago, Ann served as Sally Brown Fellow in Environmental Literature at the University of Virginia, where she taught undergraduate seminars on literature and the environment and coordinated an ongoing reading series featuring nationally prominent nature writers. Prior to that, she spent a year as a research assistant at the Smithsonian Tropical Research Institute's field station on Barro Colorado Island, Panama, studying how young leaves defend themselves against herbivores.